Which cities offer the best career prospects, and would you be open to moving for the right job? Two new reports from Robert Half shed light on these questions. 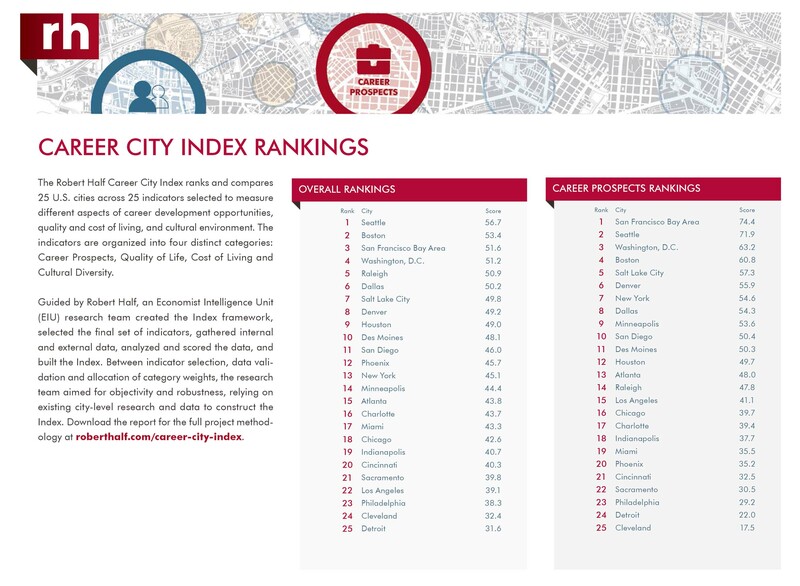 The Robert Half Career City Index, commissioned by Robert Half and developed by The Economist Intelligence Unit (EIU), ranks Seattle, Boston, San Francisco, Washington, D.C. and Raleigh as the top five career locations overall based on four factors: career prospects, cost of living, quality of life and cultural diversity. Dallas, Salt Lake City, Denver, Houston and Des Moines round out the top 10. A second study, the Robert Half Relocation Survey, shows most professionals are open to the idea of accepting a job in a new city. Sixty-seven percent of workers would consider relocating for a job, and 37 percent believe a move would improve their career prospects. The most important factors in deciding to relocate for a job are tied to money: A higher salary (88 percent) and a lower cost of living (61 percent) ranked substantially higher in importance than being closer to family and friends (39 percent) for the workers polled. Steady job growth, a solid housing market and workers’ confidence in their career prospects are some of the factors encouraging people to pull up stakes, according to Paul McDonald, senior executive director at Robert Half. He advises those contemplating a move to look at a variety of factors. “Think beyond the job offer and consider the stability of the organization, your long-term career path and what appeals to you about living in the new area. Your satisfaction level with relocating depends on more than just a great starting salary,” McDonald said. Workers in the South and West regions of the United States are significantly more likely than those in the Northeast and Midwest to consider relocating for work. An equal percentage of men and women (39 percent) consider being closer to family and friends an important factor in deciding to relocate. 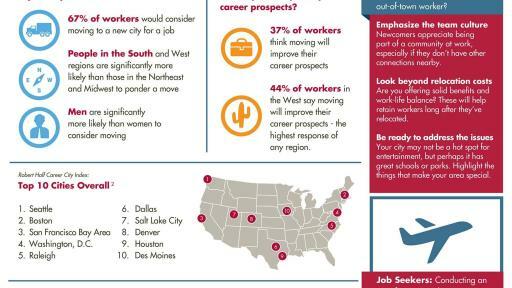 Thirty-six percent of survey respondents are unsure whether moving to a new city would improve their career prospects. Men are significantly more likely than women to believe moving will improve their career prospects. Survey respondents in the Northeast, South and Midwest regions are significantly more likely than those in the West to consider a higher salary an important factor in deciding to move. According to the EIU research, a growing number of businesses are relocating to city centers to be more accessible to their workforce and to future talent. McDonald noted that staffing firms can be a valuable resource for those looking to make a move. “Staffing firms have large networks that can help professionals and their families get a foothold in a new city,” he said. 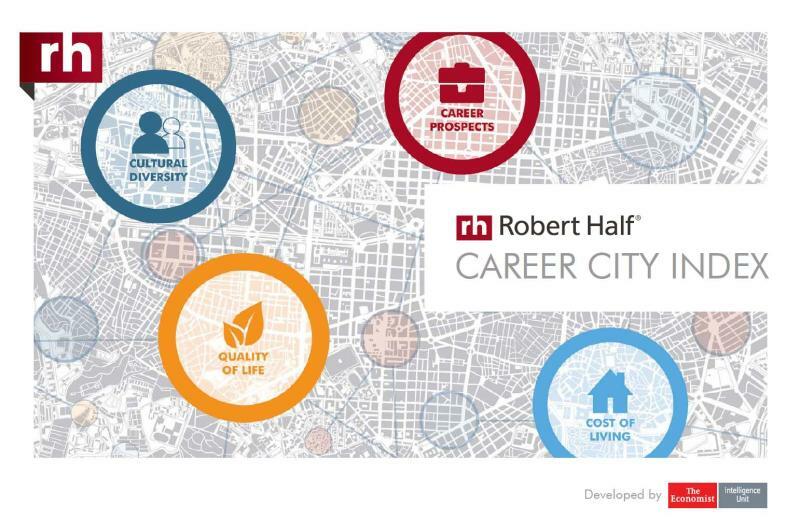 The Robert Half Career City Index was commissioned by Robert Half and produced by The Economist Intelligence Unit. 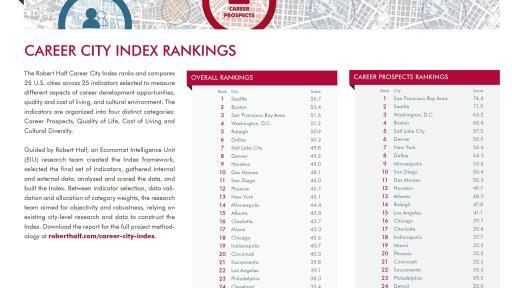 It ranks 25 U.S. cities on a variety of indicators across four important categories: career prospects, quality of life, cost of living and cultural diversity. The full report, a quiz and other information is available at roberthalf.com/career-city-index. The Robert Half Relocation survey was conducted by an independent research firm and includes more than 1,000 U.S. professionals. Founded in 1948, Robert Half is the world’s first and largest specialized staffing firm. The company has more than 340 staffing locations worldwide and offers online job search services on its divisional websites, all of which can be accessed at roberthalf.com. 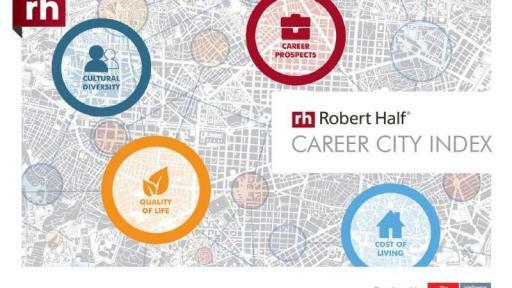 For career and hiring advice, visit the Robert Half blog at roberthalf.com/blog.